Helen & I returned on the 19 Apr from a holiday in New Zealand. I was very grateful of the organization carried out by Phil Aplin Ex 1 RAR in my absence. 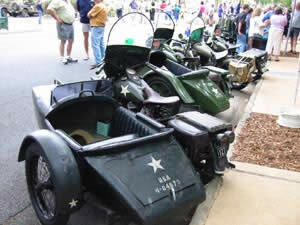 ANZAC Day this year was bigger than last year, ie the numbers were up and the participation of schools on an increase. 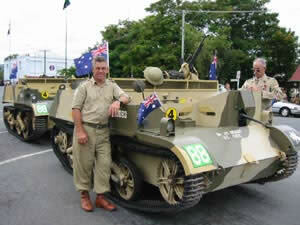 Rockhampton was host to the Australian Army Trackers & War Dogs Association. A Dog & handler event put together by Bob Bettany Ex 1 & 6 RAR, Secretary of the Association. 10 dogs in all representing the RAAF, ARMY, Termite Pest Control and Corrections, with a noticeable absence from Qld Police from anywhere in the state. The RAAF Dogs won the Biathlon held at Western Street. Participation of schools and students will ensure the reason for ANZAC Day will continue. I was not impressed when the ANZAC Day weekend was referred to as a “long weekend” If ANZAC Day falls on a weekday, it is the only day off and never a holiday, but a day of National Remembrance. Some Schools were lucky enough to have Veteran speakers attend a school service prior to the weekend. Speaking to schools does many things, it encourages the students to take part in remembering ANZAC Day, it gives students the opportunity to talk to and get to know first hand what being a Veteran means. The Central Queensland Veteran Support Center is always looking for Veterans who are willing to speak to schools. Contact 49223616 if you think you can help. I spoke to two schools of Friday, just a short 5 –7 minute address, with morning tea after, answer a few questions and get on with the day. 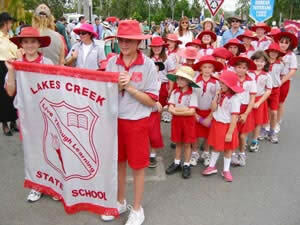 Lakes Creek School students who conducted the service are to be congratulated for a job well done. 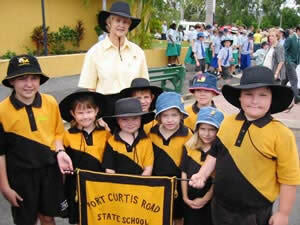 Port Curtis Road School with 34 students ranging from Grade 1 to 7 is also to be congratulated for their service at 10:30am. 14 ACU Cadets provided the guard at both schools with military precision and no doubt a lot of training by UO Parr the son of Alan Parr Ex 1 RAR. ANZAC Day was good weather wise, with a slight shower early in the morning and rain held off for the remainder of the day. 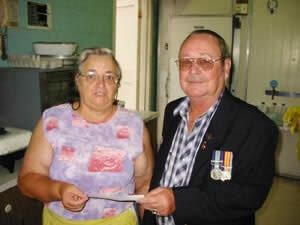 The CQVVAA presented a cheque to the CWA Ladies committee to assist with the breakfast. The ladies reported a steady flow of breakfast starters, but did note that the numbers were dwindling. Rockhampton notable Spider expert Doug Wallace was sitting opposite and in conversation we got to talk about the “white tail“ spider commonly found in gardens. Doug said that although is has a nasty bite, the one to watch is the common black house spider. Get bitten by the black house spider and you’ll know all about it. If you want to know more about spiders, visit the Rockhampton Botanical Gardens Office and see Doug’s display, collected over 50 years. 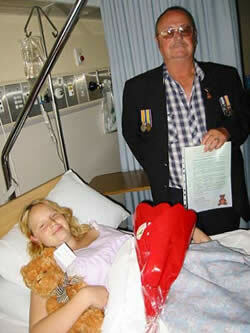 At 2:30am on ANZAC Day 2004 Samantha Hayter and Barry Collett had this years ANZAC Day Baby. 2970grams Kallum Barry Collett was presented with a Teddy bear and Samantha a certificate and a bouquet of flowers. 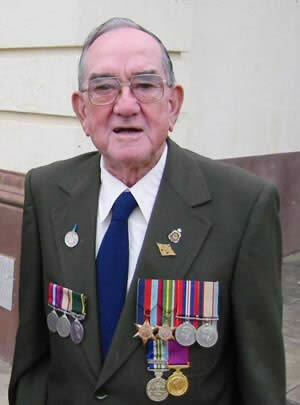 Local Veteran and Veteran family information in the Rockhampton district is available on the web and scroll down the list to Central Queensland WAR VETERANS & FAMILY Information .